While I know that it didn’t get the attention of the deaths of Dear Abby, Stan Musial, or Earl Weaver last week, I have to admit that I felt a little sad when I saw the obituary for Conrad Bain in the New York Times. A Canadian-born actor with quite the lengthy resume, Bain was a mainstay of television in my childhood ecause of his role as Mr. Drummond on Diff’rentStrokes. 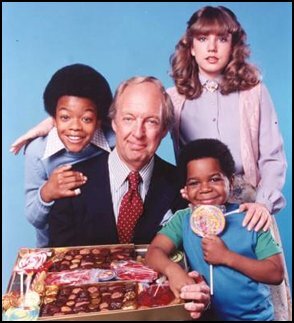 A sitcom that began airing in 1978, Diff’rent Strokes lasted until 1986 and aired mostly on NBC (with the 1985-1986 season airing on ABC) and was the story of two black kids from The Bronx who were adopted by a Park Avenue millionaire. It’s an odd concept for a show and one I swear only would have worked in the 1970s, but I didn’t think anything of that when I was six years old and allowed to stay up on Saturday nights to watch it (and sometimes Silver Spoons, which came on at 8:30). This was a big deal for a kid whose bedtime was 8:00 on the weekdays and I remember loving the show so much that I tape recorded (like literally sat a tape recorder next to the television and hit “record”) the 1984 hour-long “Mr. Drummond gets married” episode. I’m not sure if I watched it on Saturday nights beyond that, because my memory is hazy and I always associate Saturday night television viewing with The Facts of Life (briefly, anyway), and The Golden Girls (which dominated NBC Saturday nights for years), but that doesn’t matter because the show was a rerun mainstay all the way up until I was in my first year or so of high school. WNYW, New York’s Fox affiliate (channel 5) ran Diff’rent Strokes at 5:00 p.m. and The Facts of Life at 5:30 p.m. through much of the latter part of my elementary school career, concluding it sometime when I was in junior high (what it was replaced with I don’t remember, although eventually Fox 5 ran The Simpsons, Seinfeld, and Friends). Since I didn’t have cable at the time, that meant I would come home, turn on the television, and at 5:00, after cartoons were done, I would see a familiar shot of the east side and hear Alan Thicke’s lyrics: “Now the world don’t move to the beat of just one drum …” Then, it would be Arnold, Willis, Kimberly (unless it was one of the seasons where Dana Plato had been fired for being knocked up and using drugs), Sam (whose mushroom haircut I hated), and Mr. Drummond. Bain played Mr. Drummond like a typical sitcom father, imparting some of the show’s lessons like Robert Reed did on The Brady Bunch (a show that I remember seeing for the first time at an incredibly early age and much like Diff’rent Strokes always seemed to be on) and making some lame attempt at a joke every once in a while. He wasn’t the type of sitcom father whom you felt was “your father” or a ‘dad”; he was just … well, there, the mainstay of a show whose cast was full of problems (though I honestly didn’t know that until years later). In fact, I don’t remember Mr. Drummond being much of a factor in most of the episodes, especially the two most memorable ones–the Nancy Reagan anti-drug epsiode, and the two-parter about sexual molestation where Gordon Jump plays the bike shop owner (though Mr. Drummond does call the authorities and is the “moral voice” throughout). He did, however, have a couple of episodes that stood out. Aside from his romancing Maggie (first played by Dixie Carter and then Mary Ann Mobley, who replaced Carter after NBC canceled the show and Carter went to Designing Women), there was the time Mr. Drummond came home with his neck all cramped from stress and the family discovered that Willis had severe stress and had to learn to balance the activities in his life. There was the “Undercover Boss” episode where Mr. Drummond works at one of his company’s factories to see what it’s like to work there and challenges the entire family to “live blue collar,” which for Arnold means wearing a Van Halen T-shirt because that’s what poor people do or something. And of course, there was the two-parter where Sam was kidnapped and at some point, Drummond had some fisticuffs with a possible kidnapper, a scene that I remember prompted my friend Harris and I to come up with the idea for a fake movie: “Conrad Bain is X-CUTIONER 3000.” Yeah, I don’t know why Mr. Drummond as Charles Bronson in Death Wish was so hilarious but when you’re 13, you find some of the most random crap funny, I guess. Besides, when I told him about Bain’s death the other day, he replied, “Bonar Lives!” in reference to Conrad Bain’s twin brother Bonar, something we also found funny at 13 (and I’m amazed that I never wrote BONAR LIVES! across the front of my notebook as if it were “Save Ferris”). Anyway, there’s only five cast members left alive from Diff’rent Strokes: Todd Bridges (Willis, who had his share of substance abuse issues but has been clean for about 20 years), Danny Cooksey (Sam, who has a decent-sized voice-over resume and was in Terminator 2 as John Connor’s mulleted friend), Mary Ann Mobley (the second Maggie), Mary Jo Catlett (Pearl, the third maid, who now provides the voice of Mrs. Puff on SpongeBob SquarePants), and Charlotte Rae (Mrs. Garrett, who will outlive them all). And I’d like to say that the show taught me so much, but like Mr. Drummond, I think I watched it because it was simply always there.